It wouldn’t be a 4th of July cookout without a fresh fruit sangria! A simple, slightly sweet drink (…or pitcher) is the perfect way to cool off when you are outside celebrating with friends and family. For this recipe, we will turn a classic, crispy white wine into a refreshing white wine fruit sangria. The first thing that I wanted to do was create a light, flavored base for the sangria. I used a Riesling wine, but wanted to add a bit of bubbles and bang with a flavored soda water. Typically, a ginger ale may be added. I tested a few favorites, including lingonberry/apple, raspberry/blackberry, cherry/lime and strawberry lemonade soda waters. 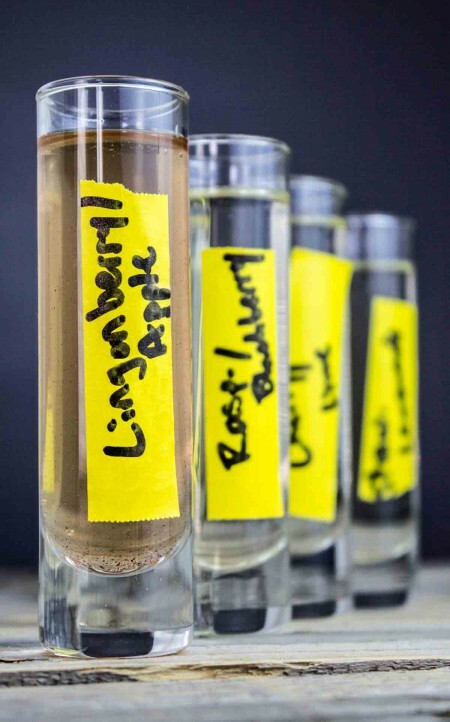 The lingonberry/apple was a quick pick from my last Ikea trip and ended up giving a great taste, but a bit too much sweet apple for my liking in this recipe. I will certainly use it in a cocktail later on, though. I opted for the raspberry/blackberry since it was a bit more calm and refreshing and less of a sweet syrup flavor than the other candidates. This should be simple to find, as most every grocery store carries flavored soda water. 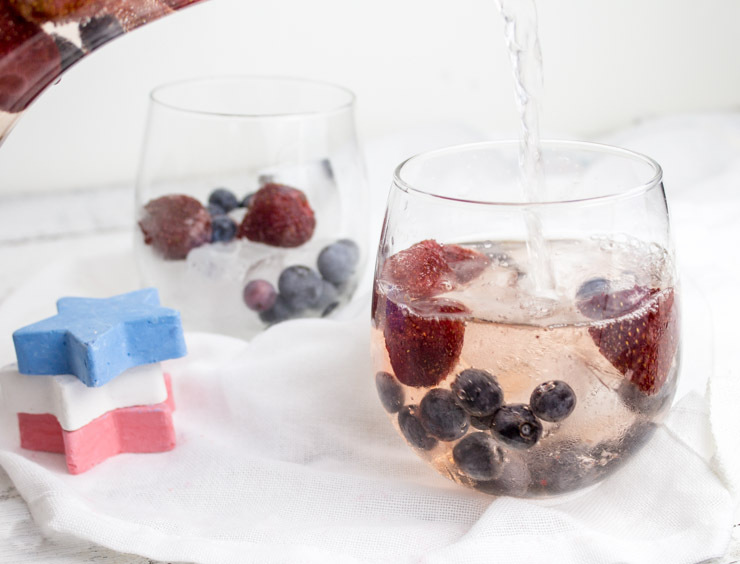 Since I had some strawberries in the freezer from making it out to pick at a local berry farm (check out the Strawberry Cinnamon Chip Scones for more of those), I used those along with some local blueberries to give the drink a shiny 4th sparkle. 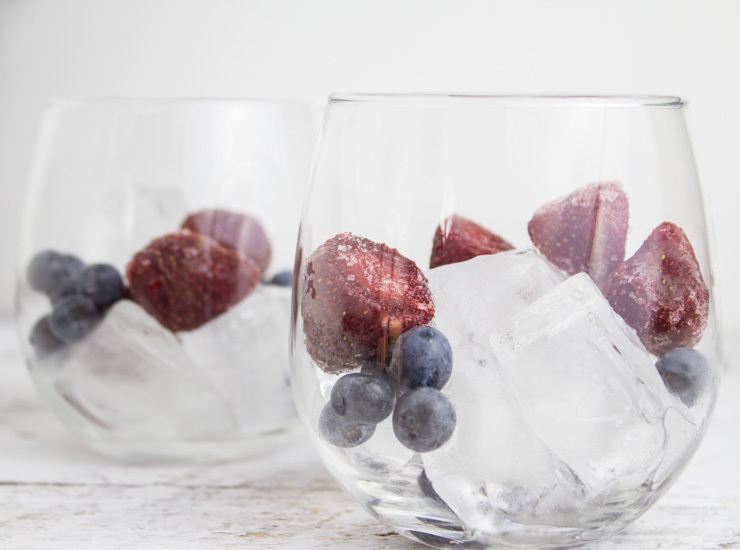 The frozen strawberries keep a great chill to the sangria, too. Since people are typically familiar with a 5th of liquor, I thought I would brand this sweet concoction with the name 4th of Wine Sangria. A fifth of alcohol actually gets it’s name for 1/5 of a gallon. That is how booze was delivered back in the day before the switch to the metric milliliters measurement. A 4th of a gallon comes out to 4 cups. Handy, eh? 4 cups of your favorite Riesling will do the job perfectly to make this sangria your new party favorite. Have a great 4th celebration, y’all! Enjoy time with friends and family. Be sure to leave us some love and say hello below. 4th of Wine Sangria - Crispy, refreshing fresh fruit sangria. Combine all ingredients in carafe/pitcher. You can leave fruit out until serving, if desired. 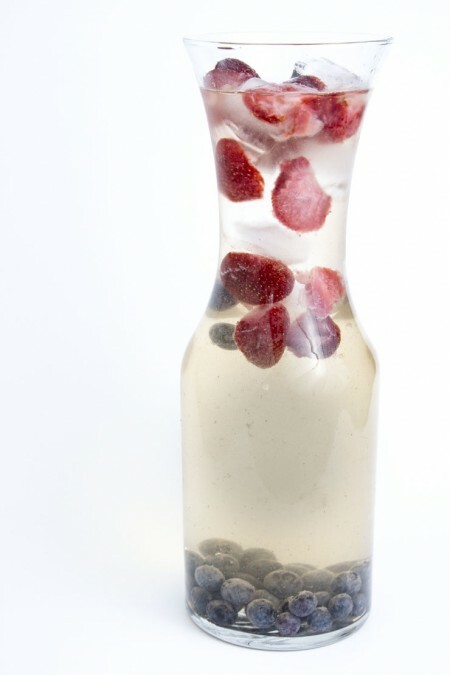 Strawberries may cloud sangria if left overnight. Chill and serve very cold over ice. Enjoy! Visit SouthernFATTY.com for more delicious recipes. Happy 4th. Didn’t know where 1/5 came from. We love Sangria and all that fruit too. It’s a perfect cookout drink, I think 🙂 Have a great holiday. See you around soon!